Autumn is, without a doubt, my favorite season. There is just something so magical about it to me, more so than spring or summer. Winter is a close second (though the winters here in Minnesota can be as brutal as they are beautiful), but autumn is a special time of year. I think this is due in great part to how brief it is—our autumns do not last long, so it’s important to really enjoy them for the few weeks we have them. To get out and enjoy the changing colors of the leaves in all their splendor, taking in the crisp air, taking long walks and listening to the leaves crunch beneath your feet, returning to drink hot apple cider or enjoy one of the (many) pumpkin-spice-flavored things that come out this time of year. Moving away from colorful, overly flowery descriptions of the season, my favorite part of autumn is that it also means it’s time for my favorite holiday: Halloween. As many do, I adore this holiday. Many people have their own ways of celebrating, but I prefer the creepiness of Halloween. I love to use the time to read horror novels, watch horror movies and play survival-horror games. And it was initially my intention to review one for the season, but I couldn’t seem to find one coming out. I found myself stuck in the conundrum of that the ones I could find didn’t grab my attention enough to warrant wanting to review them, and the ones that did grab my attention were yet to be released and had no confirmed date aside from the general season. Something else, however, did catch my eye that seemed appropriate: Elder Scrolls Online. Yes, another popular trend this time of year (and one that I love) is seasonal Halloween events for online games. As I write this, Overwatch had an excellent one, and Final Fantasy XIV held its yearly All Saints’ Wake event. 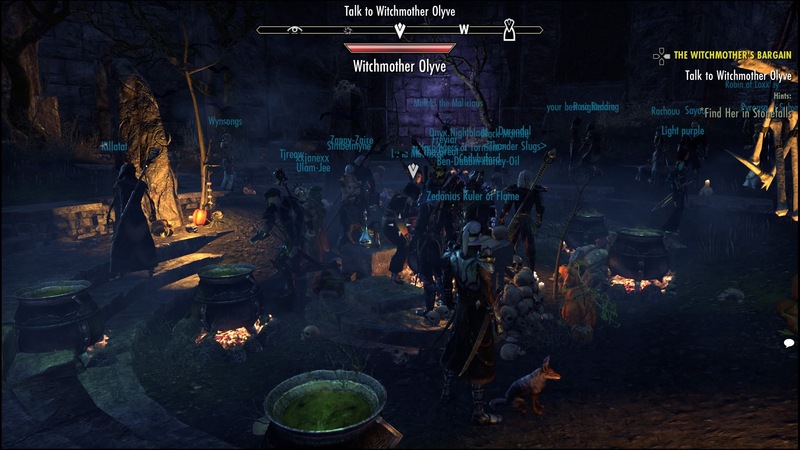 I found Elder Scrolls Online the most enticing to talk about because it was announced that the game would be having its first ever seasonal event: the Witches Festival. 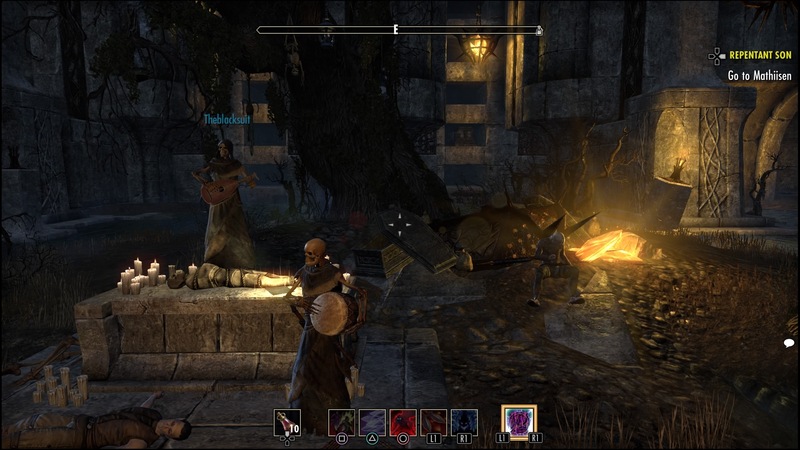 For some time, I had been wanting to see ZeniMax start putting in some seasonal events into their MMO, and I couldn’t have been more excited to hear that they were finally doing one, let alone one in celebration of my personal favorite holiday. So as we transition now into the next holiday season, I’m going to have to do something a little different from what I’ve written before and give my experiences and impressions looking back on Elder Scrolls‘ first seasonal event. 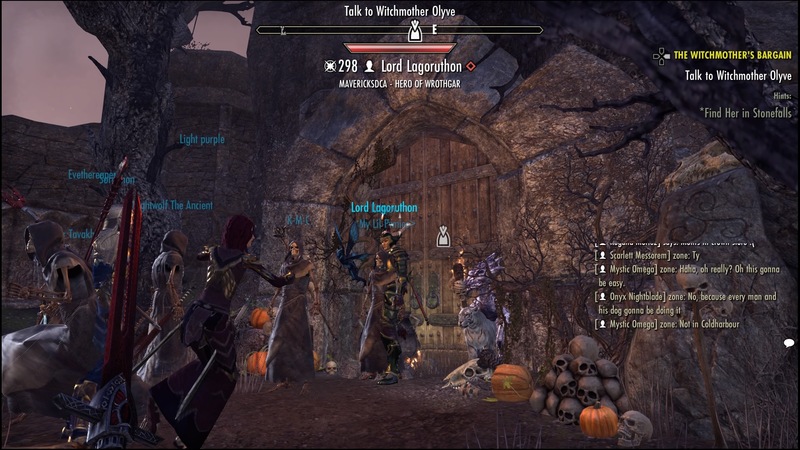 The Witches Festival began with a single item, known only as the Crow Caller, which was available free in the Crown Store and was the key to starting the event. It definitely had me curious. As I expected from its name, when I used it, several crows came spiraling down from the sky, and before me appeared a witch, a hooded and withered old crown dressed in black garb, wielding a crooked staff. Witchmother Olyve, she was called. 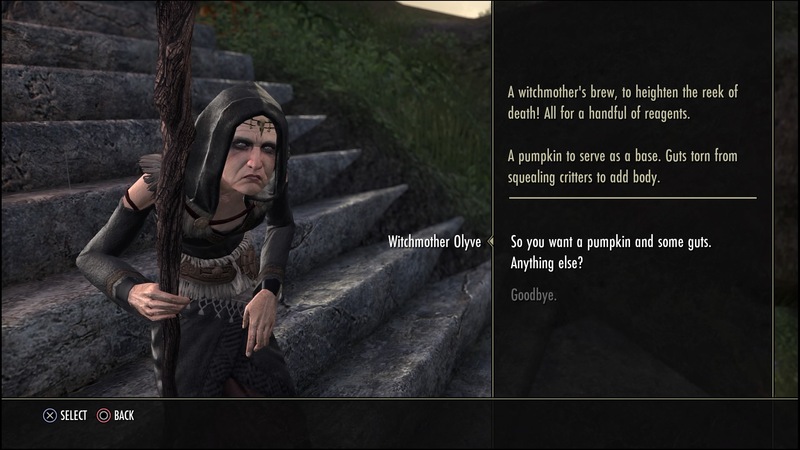 She gave me a (relatively) simple task: since I “reek[ed] of death” she enlisted my help in making a brew to “heighten the reek of death.” The task I was given to collect a pumpkin, the guts from a creature, and the essence of death. The first two were simple enough to get, as they can be obtained from any merchant in Tamriel. The last, though, required me to beat a boss in a dungeon and collect their “death essence.” What that is exactly is left to the imagination, though I can’t imagine it’s anything pleasant. Witchmother Olyve certainly felt like a classic witch. After getting all of this and returning to the witch’s lair, which was incredibly difficult to find until a few players online decided to help direct others where to go, I went inside and had her give me an item I could use: the Witchmother’s Whistle. It summoned a cauldron, and when I drank from it, it turned me character in a robed skeleton. This led to the second part of the event. As long as I was in this form, which lasted for two hours, any world boss I fought would drop a “plunder skull” that would have several random items. This included a rare drop of one of a series of books on a new crafting motif, the “Hollowjack” style, one befitting a holiday like the Witches Festival. The Witchmother’s lair had a perfect vibe for the holiday as well. Can’t go wrong with skulls and pumpkins. At first, I was surprised how quickly the initial story of the event ended. There wasn’t really much of one at all, though that is something I’m used to, at least with the events of Final Fantasy XIV. Though that is not a mark against it. It having been the first one, I didn’t expect it to be elaborate, and it being short didn’t make it any less enjoyable. In fact, it worked incredibly well as a community event. When it comes to—Elder Scrolls Online, I’m very much a solo player, even if that may defeat the purpose of playing an MMORPG. This event, however, got me out and interacting with the community. Players using their new cauldrons in Olyve’s lair. At first, it was what I expected, players simply crowding around where the event was taking place, going at their own pace, and not taking much interest in the players around them. Yet it wasn’t until I found myself actively hunting down these bosses for Plunder Skulls that I felt the event was working as it was intended. I found myself forming parties with strangers, something that I don’t do often in the game, to make it easier to get through the dungeons and take on these bosses to gain more skulls. Players were willing to wait for others to get to the boss room before taking them on to make sure they would be in the fight as well and get the same reward. There was some degree of tedium in having to go from dungeon to dungeon and kill boss after boss or having to camp out in the same dungeon and repeatedly kill the same boss for plunder skulls. This was added onto the fact that not every plunder skull contained the crafting motifs, and it was possible to get the same one. But that didn’t take away from the event as much as it could have, even more so because I was with other players and it was something we were all in together. If I had decided to do it on my own, that may not have been the case. Skeletal jam session while waiting for a boss to spawn. It wasn’t the most elaborate event, overall, and didn’t introduce a new or unique challenge or gameplay element to the world itself. However, there isn’t anything wrong with that; it would be unfair of me to expect that from the very first seasonal event they’ve ever tried. It did succeed, though, in capturing the spirit of the season. It felt classically Halloween, and it did work well as a community event. It got me out of my usual habit of going solo through the game and into actually spending time with the other players around me. In the end, that’s the point of a community event, and I did enjoy it overall—so I can’t help but look forward to the next Witches Festival and any other seasonal events they may be planning.